This is a rare Antique Crane 4 Diameter Plain Bell Brass or Bronze Steam Whistle for a Steam Locomotive, Traction Engine, Steam Tractor, etc. The diameter of the bell is a full 4 inches. 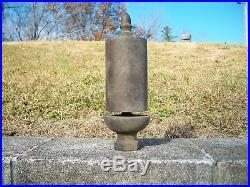 The overall height is just under 14 inches and the bell itself is just under 7 inches tall. It has a 1 1/4 inch threaded inlet. I did test this whistle on my air tank a while back, and it works and sounds great with a very pleasant, mellow sound! 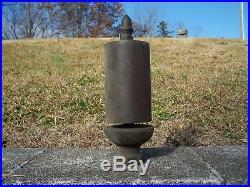 This antique steam whistle is in good condition with a very nice patina. No dents, dings, or repairs anywhere that I can see. The bell does set off center just slightly. The item "Crane 4 Brass Steam Whistle, Antique Plain Bell, Train Steam Locomotive, Works" is in sale since Wednesday, December 06, 2017. This item is in the category "Collectibles\Transportation\Railroadiana & Trains\Hardware\Whistles, Bells & Horns". 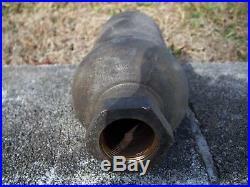 The seller is "rareitem" and is located in Maynardville, Tennessee. This item can be shipped to United States.